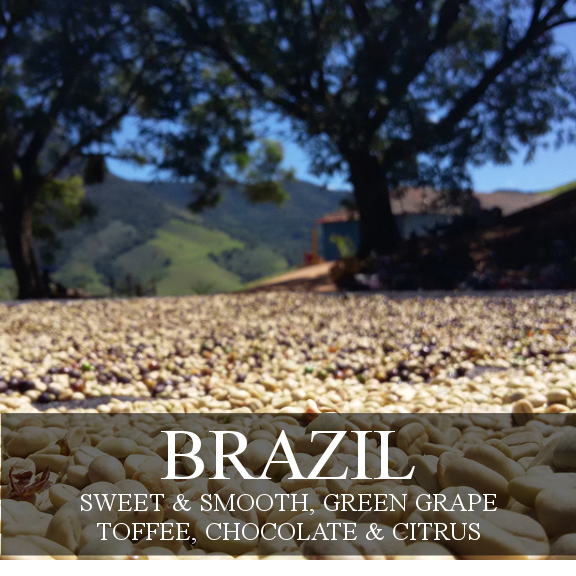 Balanced, rich and sweet with tart winey acidity and a smooth mouthfeel; very fruity with sugary flavors, apple, lime, cherry and chocolate flavors. This is a Contrast Roaster Reserve, Single Origin Coffee. 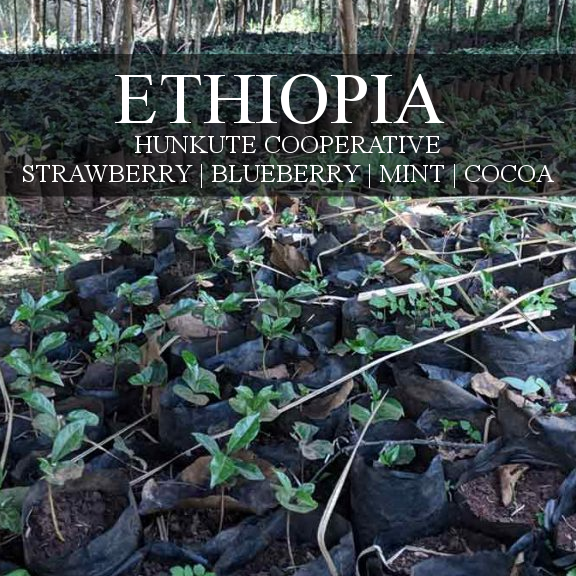 This means the coffee is traceable to a single lot on a single farm. 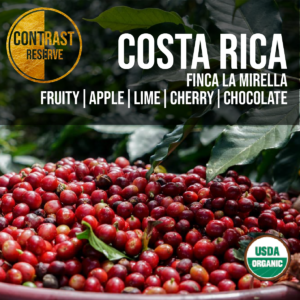 It also means the coffee is scored at 90 points or higher and has limited availability. 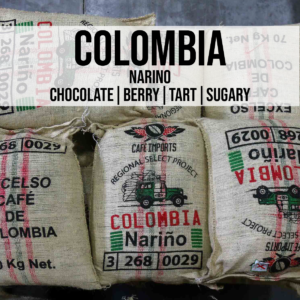 90+ coffees only make up 2% of the world’s coffee production. 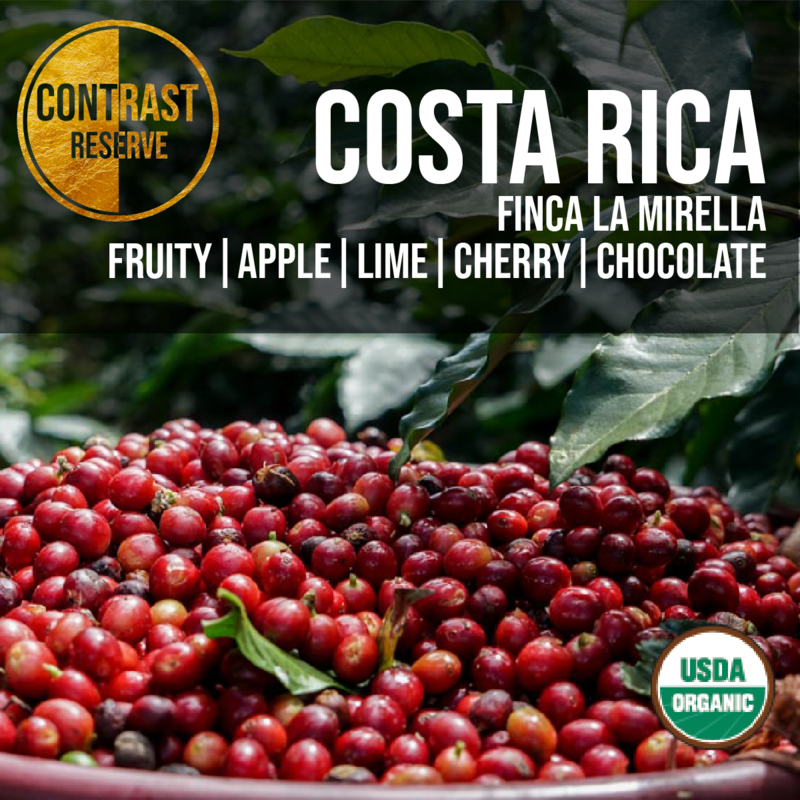 This is also a USDA Organic Certified coffee, making it even more unique, placing it firmly into our Roaster Reserve Line. Las Lajas began producing honey coffees in 2008, after an earthquake cut off the mill’s access to water for several weeks. Oscar had heard that in Brazil and Ethiopia they use pulped-natural and natural techniques to process coffees, so he tried it with his harvest that year. Around that same time, Cafe Imports founder and president Andrew Miller visited the area, and was so impressed by the flavor of the Chacons’ coffee he became one of the first buyers of the new process. Oscar believes that just as the roast profile will change the flavor of a coffee, the drying curve also has an impact. He wants the drying to happen slowly, which means that production is necessarily limited. The Chacons produce several different types of Honeys and Naturals: For this natural process they used what they call, “Perla Negra.” Perla Negra dries directly in the sun for 10 days, rotating constantly, then transferred to bags and left for 2–3 days before being finished on the raised beds.